The latest figures on growth (or lack of) are bad for the government’s deficit reduction plan; the government is terrible at cutting borrowing generally. You still hear the coalition cry that it had to cut spending because “for every £4 that Labour spent, it borrowed £1”. The evidence is now clear that unfortunately under the coalition plan A we’re doing even worse: for every £4 the coalition cuts in spending, it only cuts borrowing by 75p. As the economic stagnation of the first full year of coalition Plan A unfolds, the new EY-ITEM club forecast for the year-end borrowing is for it to be at least £8 billion more than the OBR March forecast. As we can see from the table, Darling promised to implement spending cuts of a total of £3.7bn (line B). However Osborne increased that targeted spending cuts by a further £16bn (line C). So from a budget deficit of £136.7bn (line A), Darling aimed to bring UK plc to a deficit of £133bn but Osborne was more ambitious and aimed to bring UK plc’s deficit to a targeted £117bn – a full 16bn more than the Darling plan (Line C). However due to the slow growth that resulted from the spending cuts needed to implement Osborne’s target deficit reduction, the Ernst & Young ITEM club predicts that HMRC will receive £13bn less than was expected by Darling for this financial year in tax receipts (line D). 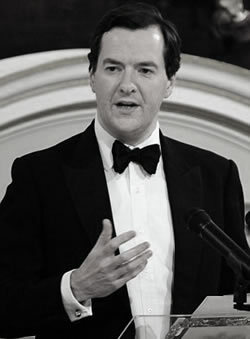 As a result although spending has been cut by Osborne by £16bn more than Darling would have cut spending (line C), the lost £13bn in tax receipts results in a total net reduction of UK plc’s deficit over and above the Darling target of only £3bn or, to put it in other words, the deficit will be £130bn (line E) compared to Darling’s target of £133bn. In summary, for the additional £16bn of cuts over Labour’s proposed plan, there has only been a corresponding reduction in UK plc’s deficit of £3bn over what Labour planned or to put it in layman’s terms, so for every £4 the Tories have cut over and above Labour, there has only been an additional reduction in the deficit of 75p. We repeat that you require growth to cut the deficit. Labour’s Darling plan for cutting the deficit was based on growth cutting the deficit. And we now know that because 2010-11 saw the fastest growth for a decade that growth cut the deficit by £10bn alone. This year, with still 6 months to run, the cost of the Plan A stagnation has been £13bn. The ITEM club forecast is now for the coalition will borrow more than Labour in its first year of plan A! The problem for the coalition is that as a consequence of them breaking their promise to protect our banks from the resurgent international banking crisis this could get even worse. Is it possible that there will be no reduction in the deficit at all? If our banks are forced to de-lever because the crisis is not addressed, then is it possible that there will be no reduction in the deficit at all? Maybe Cormac would like to explain the Japanese economy during the period 1990 to the current day, with reference to a policy of running budget deficeits?